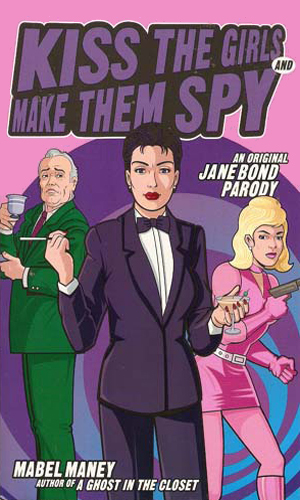 Jane Bond is the sister of James Bond and a substitute-spy. 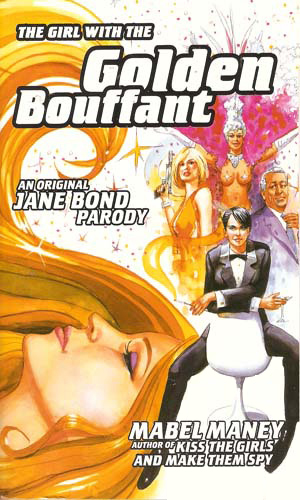 There have been other parodies of James Bond, though usually as short stories or single books. This is unique by having the agent a sister to the famed agent. More importantly, she is an identical twin which makes her able, with the right haircut and clothes, to impersonate her brother. In real life, Jane just can't seem to get her act together. She works at a bookshop where she is not very happy and is in constant danger of being fired. She had no luck with lovers as Jane's roommate stole her last one and then kicked Jane out for being such a bore about it.. And she has the same love of imbibing as James, though without perhaps his resilience. So, as the series starts, she is 35 with no real career, few friends, no prospects for either, and is forced to take a small, drab room at the Flora Benton Residential Hotel for Distressed Gentlewomen. That is when the SIS comes calling. Brother James, it seems, is in a rest home recovering from anxiety. He doesn't want to be a spy anymore and he is in no condition to work but a mission has come up that needs Bond, only James Bond. Since he is not available, well, there is his twin sister Jane. Although these books are written as a parody, they do so by not giving in to slap stick. There are real plots to the books, albeit frivolous ones, making it seem as though James really did have a sister. They are also good a poking a stick at other conventions. Finally, the first book has a hilarious segment in which the boss's assistant, Miss Tuppenny, describes what has happened to the other 00-agents and why they cannot take the assignment. It alone was worth the price of the book. Asked to step in at an awards ceremony, posing as her brother, James, Jane inadvertently gets involved in a plot to return the Duke and Duchess of Windsor to the throne. With brother James' face in bandages due to a nasty burn accident, Jane is again called upon to help. This time she must attend the men-only International Spy Convention in Vegas and steal a secret spy device. I always worry when I start to read a parody that all I will get are one-liners making fun of the original. That is not the case with Ms. Maney's excellent humorous homages to the epitome of male chauvanism. Playing it straight (sorry!) enough to almost pass as an actual spy series, the tales of Jane Bond are more of a teasing than an insult. The author went to some trouble to give a background for the character and to give her a life, of sorts, before throwing her into her brother's covert world. And the cases are fun, especially when seen through the eyes of a woman who has no interest in espionage work and would just as soon be somewhere else. While I don't think I'd like a steady diet of Jane Bond tales, these two were fun to read.